The scores below are in various formats, as received. The audio files are all mp3 128K stereo. These are set to download rather than stream. Please perform this music. The K&D show recordings are only a beginning. Keep this music in your ears! The rules below were posted sequentially as the days progressed up to September 16th and 17th. There will be three rounds, two on Friday and one on Saturday morning. The time zone is US Eastern Daylight Savings Time, GMT-4 during this season. Those in completely incompatible time zones such as Hawaii, Australia, Japan, etc., should contact us immediately. Electroacoustic rounds will begin at 9am and noon on Friday. Acoustic round will begin at 9am on Saturday. Composers may participate in either or both electroacoustic or acoustic. The specs for pieces for each round will be announced at the beginning of the round, including instrumentation, length, and reality-enhancers such as meter, tempo, dynamics, etc. The specs for electroacoustic pieces will also be given at the same time. Important: Reread this rule. Don't do your pieces ahead of time! The electroacoustic pieces will be played in the listening room and provided on line at the conclusion of each round. The acoustic pieces will be performed in a reading session and provided on line at the conclusion of the acoustic round. Composers may perform in their own pieces, but must be at the studios and be available to play the pieces of other composers. Judges and composers will vote pieces OFF the program, leaving three or four pieces in each genre (acoustic and electroacoustic) to move to the finals during the live show on Saturday afternoon. Anything that goes wrong is your own fault. For online participants doing acoustic music, we will post the specifications for the music at this bulletin board (http://kalvos.org/phpbb2/) at 8:30am on Saturday. Final score and parts will be expected at noon via email (PDF or Finale up to version 2005) or FTP or as a last resort, via fax. We'll have only one fax line at post the number later, so that will be harder. PDF is preferred format. For online participants doing electroacoustic music, we will post the specifications at this bulletin board at 8:30 and 11:30am on Friday. Final music must arrive in mp3 format (128K 44KHz stereo) to FTP or to an email address to be posted later. Electroacoustic submissions should be made via FTP, to ftp://maltedmedia.com/incoming/ This is an anonymous FTP site, incoming only. You can't change or download from it. Please try to upload a binary file to be sure you can do it. You may also submit by email. The specs for the electroacoustic pieces will include a sample from us, so be prepared to download from ftp://maltedmedia.com/kombat/ Please read the readme.txt file now to be sure you can get the sample when it's posted. 2-5 minutes, 20-100 measure long, using at least 2 performers from flute, oboe, horn, 2 soprano voices. 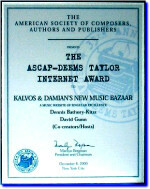 As most of you know by now, KALVOS & DAMIAN'S NEW MUSIC BAZAAR ends its broadcasts with show #537 on September 17, 2005. The decision was personal. Not only does K&D demand many hours, but we also can't cover its costs. There is a future. We will continue on-line interviews as we cross paths with composers, and we will transcribe all interviews over the next year. We'll also give the site a cosmetic update, fix stuff that's broken, and tie a ribbon around K&D as the 10-year "Chronicle of the NonPop Revolution." Here's the good news: Show #537 on September 17 will be the culmination of a two-day event called KOMPOSER KOMBAT (K2). Loosely modeled on Survivor-style TV shows, it will involve composers, performers, judges, saboteurs and support folks. During three four-hour rounds, composers will compose from a set of specifications. They will create the score and parts, or in the case of electroacoustic pieces, produce a final piece. Performers will present the music in live reading sessions. When we first discussed this with our board of advisors, some worried about the idea of a competition. We mean this as a collegial and fun event -- one last K&D-style take on how composers live and work. Yes, like Debussy, some composers can't choose between a pair of chords in four months much less in four hours. That's okay. Take part in some other way! PERFORMERS. No matter what you play, if you're a good reader, be part of this event. Pieces will be specified and written based on who performs. Composers are eligible to play as well as compose. SUPPORT PEOPLE. Making sure parts are in place, taking care that MP3s are downloaded and ready to play or broadcast, documenting happenings with video or composer-on-the-street interviews, making certain that the pizza is hot, etc., are all part of the support work. This is a party, too! K2 will take place in Studio Z at WGDR in Plainfield, Vermont, and the entire event will be recorded. There will be prizes and lots of tchotchkes. There will be three rounds, two on Friday and one on Saturday morning. Each round's composers will be drawn by lot. The specs for pieces for each round will be announced at the beginning of the round, including instrumentation, length, and reality-enhancers such as meter, tempo, dynamics, etc. The specs for electroacoustic pieces will also be given at the same time. The pieces will be played in a reading session at the conclusion of each round. Composers may perform in their own pieces. Judges AND composers (yes, that'll mix it up!) will vote pieces OFF the program, leaving two pieces in each genre (acoustic and electroacoustic) to move to the finals during the live show on Saturday afternoon. That's pretty much it. Pie throwing is allowed. And yes, we still need funding to keep the site on line. Contributions will be even more important when we go 100% virtual. If you don't already know how to reach us, then contact us this way, please: The Contact Form.